We hosted another successful Open Mic for Redwood Writers last Saturday. Over 30+ attended and we hosted 17 readers. Thanks to all who came! Our next RW Open Mic will be on Saturday, December 22, 2-4 p.m. at SoCo Coffee. 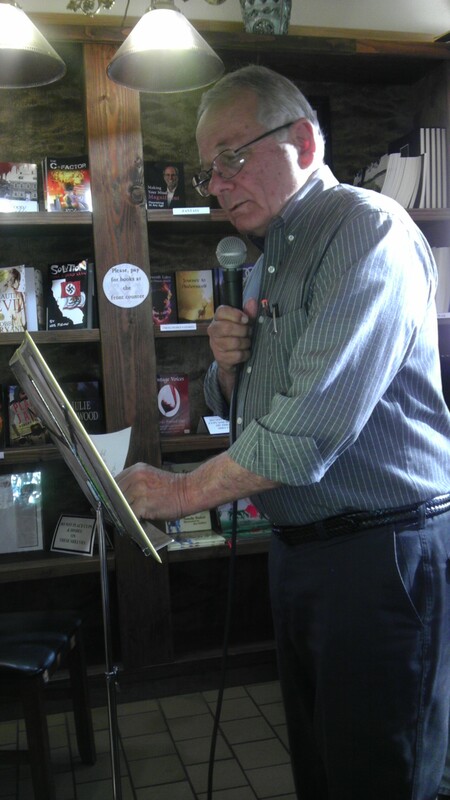 Open Mic sigups start at 1:30 p.m.
John Lesjack reads in this photo. John has become a regular reader at the Open Mics. He admits to “writing for profit” and has sold numerous articles and short stories. His most recent will appear in another volume of the Not Your Mother’s Book series. Watch for it in December. This entry was posted in authors, California Writers Club, humor, Kids' stories, poets, Writers and tagged California Writers Club, poets, reading, writers. Bookmark the permalink. It was a wonderful afternoon with a very large and receptive audience. The walls at SoCo were bulging! Thanks Robin and Abby for this holiday treat! Thanks, Arletta! You certainly contributed your exquisite writing for our pleasure. Your words are music to my eyes!